CJA is now accepting applications for students who will be in grades 3-8 for the 2019-20 school year. Please apply as soon as possible. 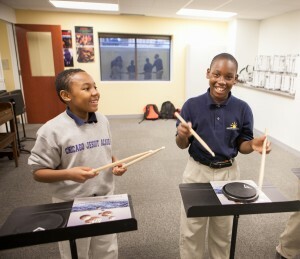 Admission into the summer Higher Achievement Program (HAP) for grades 3-5 is determined on a first-come, first-served basis and is the first step in earning admission and a full scholarship to attend Chicago Jesuit Academy. CJA is not academically selective for students applying for grades 3-5. For students applying for grades 6-8, the summer Foundations Program is the first step to earning admission to attend CJA. CJA is academically selective for students applying for grades 6-8 and admission into the Foundations Program is based on the student’s grades, test scores and conduct records at their prior school. If you are interested in attending school at CJA, the 2019 application is available now. Students must have been eligible for free or reduced-price meals through the National School Lunch Program at their prior school or be experiencing an extraordinary financial hardship. Students and their families must be prepared to commit to an extended school day and an extended school year. Students must show evidence of academic motivation and personal potential. Students must demonstrate good student citizenship and character. There must be evidence of parental cooperation and support. Please Note: If you have any questions about admissions policies or procedures, please contact us at 773-638-6103, or apply@cjacademy.org. We look forward to receiving your application soon!